The OPTIKA digital microscopes Series are equipped with a camera integrated in the head of the microscope or an integrated LCD screen, a perfect solution for interactive teaching. The entire series, from models dedicated to teaching to those intended for laboratory use, are equipped with “plug & play” software and is the ideal solution for capturing images and video and transfer them to a PC. 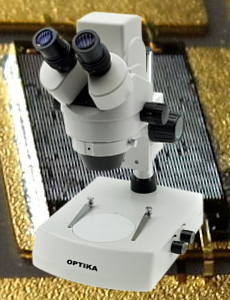 OPTIKA digital microscopes are the easiest instruments to use in order to catch pictures from a microscope and show them on a pc monitor.In addition, the whole OPTIKA digital series presents a remarkable quality. 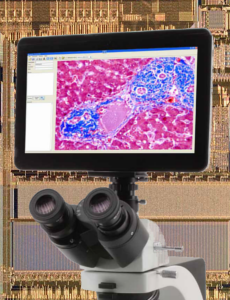 From educational instruments to laboratory ones, all the microscopes have an excellent basic equipment and a complete “software package” very easy to install. 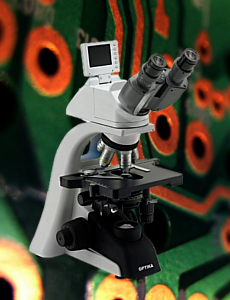 The stereomicroscopes of the SZM series are instruments specifically designed for labo- ratory and industry appli- cations. Their optical and mechanical qualities place them at the top of that sought-after category of appliances and the price/ quality ratio is exceptionally good. Thanks to different resolutions, all digital cameras (to be used with PC or TV set) can meet the demands of either a professional user or people who are looking for an economic but valuable product. Several models (OPTIKAM B2, Pro LT models, and pro Cool 5) are designed to be used on trinocular microscopes by using specific adapters.